I'm in the process of transferring the routes of the first three stages of my circumnavigation of the Czech Republic to Bikemap.net, where they will be on display to the world and his bicycle. Winter is upon us in Prague. This morning there was frost glistening on the rooftop outside my flat. A smattering of snow is forecast for the weekend. I’m planning to keep cycling as much as I can in and around Prague throughout the winter. However, I won’t be able to resume my ride around the Czech border until next spring, and that seems an awfully long way off at the moment. To console myself, I’ve been looking back at the photos of my travels earlier in the year. It occurred to me to put together some of my favourite snaps that hadn’t made into any previous posts. So here they are. It’s exactly one year since this blog - an ongoing account of my cycling circumnavigation of the Czech Republic - stuttered into life. 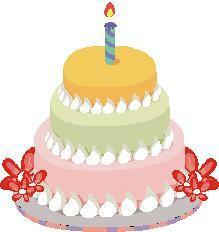 To celebrate its birthday I’ve baked a lovely virtual cake.